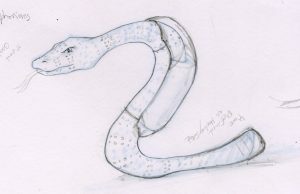 Description: The Aphorians are bright red snake-like beings, with some yellow scales in different patterns. They are four feet long, and as big around as the leg of a Human adult. They slither around wearing long yellow shells running along most of their backs. This makes them look a little like earthworms, but this protects them from sharp objects like skate blades. The Aphorians have shape-shifting tails, which they can change into whatever they need: A hand, a hammer, a fork, or a hockey stick. Culture: The Aphorians are very close to each other. This is because they’ve always had to work together in large groups to build things. It’s also due to the fact they have really big families. Some Aphorians have over fifty siblings. You can read a lot about an Aphorians’ family history, interests, and their job by reading the pattern of yellow scales they keep along their bodies. Scouting Report: The Aphorians play a very unique style. Their powerful bodies can jump and slide in unusual ways, so you have to be on your toes when playing them. Being so fast and low to the ice means they’re nearly impossible to hit, which takes away the physical element of hockey. When you play the Aphorians, your goalie better be ready to stop some crazy shots! Fun Fact: When Aphorians learned about Earth, they were surprised to learn the planet had so many kinds of snakes, but none could change the shape of their tails. They were also shocked that snakes weren’t the dominant species on Earth.